Nyamasore is an area on a peninsular in Lake Victoria about 1 1/2 hours from Kisumu, to the west and south. It is a sandy area and nothing much grows there without irrigation. It is home territory to Gabriel Abanga. He and his wife Grace are intending to retire in the area and are building a house there. In the process of being out there, Grace noticed a number of her neighbours were struggling to live and survive so she began a small loan programme, bringing small amounts of funds from a loan programme she is currently running in Nairobi. The impact has been incredible. Three groups of farmers are now growing vegetables and earning a living from their gardening. In the process, many of them are hearing the Good News about Jesus. This partnership is based around boosting the loan funds so the farmers can receive a better income and become self-sustaining. At present they have to hire water pumps and pipes to irrigate their crops. They predominantly grow tomatoes and mainly in the dry season. Other farmers grow at the same time so the markets are flooded and the price is low. The loans will make it possible for them to cut costs by not having to hire equipment and will also give them the ability to develop other opportunities. They want to grow vegetables in small greenhouses during other seasons and also make tomato products so less fruit is wasted. This would not be possible without some capital funding. Each of the farmers has their own plot of land and in September 2016 they began working on a group plot to generate income for the group. The plan is that this money will go into the pool to assist them to grow. Funds from Bright Hope World will boost this pool. The initial commitment is to provide funds for three years and then reassess the growth. Loans will be given to groups to assist them to purchase materials and equipment. BHW's New Partnership Facilitator has known Gabriel and Grace since 2000. They are pastors in the MCO-OCC network in Nairobi (KEN01b) and he met them on his first or second visit there. In subsequent years they did not have a lot of contact but met up again in 2015 when Gabriel and Grace shared what they wanted to do out in the West and communication was recommenced. Following a visit by BHW's New Partnership Facilitator in October 2016 and further communication, BHW commenced partnership with Gabriel and Grace in May 2017. The 30 or so current farmers and their families in the three existing groups and then other groups that will form in the future. Grace is constantly being asked to start new groups because locals are seeing the benefits of being in these groups. However, she is going slow so as not to overstretch her capacity. These people are well qualified to lead and passionate about the area. They intend to retire here so they have a long term commitment to the area and the people. The people they are working with are poor and for many years have struggled to survive. They have both economic and spiritual concerns for the people. This is small enough in terms of area, people and amounts to make a significant impact on many people. 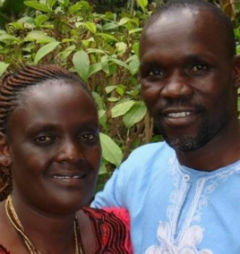 Gabriel and Grace have been married for 30 years and have four grown up children, one whom is married. They have been involved in Christian ministry in different parts of Kenya and have a good understanding of the country's socio-economic and cultural issues. While Rev. Gabriel's ministry has focused on church planting and Christian leadership development, Grace's main focus has been on child development and socio-economic empowerment of communities. Grace's social organizational skills have enabled her to organise communities and particularly needy Christian believers into socio-economic empowerment ventures. Grace is a holder of B.A Theology, Int. Certificate on Leadership Development for Youth through Non-Formal Education (Histadrut-Israel), Higher Dip Project Management, and Higher Dip. in Counselling. Grace worked with Compassion International as a social worker and then project director for 18 years. She left Compassion in 2011 to join Rev. Gabriel in church planting and ministry, where together they started and implemented a micro-finance project in the church to empower the needy members. She is now full time in church ministry and implementation of the projects. Grace is passionate about empowering the needy in communities and the church. Rev. Gabriel Abanga has a M.A Counselling Psychology, B.A Theology, Higher Dip. Surveying and Mapping, and Dip. Land Surveying. He is currently the senior minister at Outreach Community Church, Luckysummer, Nairobi and the Founder/Executive Director of Resource Institute for Community and Human Development Agency - RECADA. Rev. Gabriel has vast ministerial experience in the Church Planting Movement (CPM), Christian leadership, church ministries and missions. The vision is to empower farmers in this area to become economically self-sustaining and in the process to introduce them to a relationship with God. This area is severely underdeveloped and this will become a catalyst for future development. To form groups of farmers to grow vegetables together and market them. In five years there will be a number of groups in that area and a collective marketing of their produce. This will result in many of the local people being self-sustaining instead of struggling to survive as many are currently. This will further result in more development in the area and more young people staying because farming is profitable. The whole project is based on every person in the groups becoming self-sustaining. The loan programme should in theory grow and repayments are made with interest. These funds will then be lent out again, a revolving fund to assist the farmers grow their businesses and their livelihoods. The funds will be used to purchase essential equipment to make irrigation more efficient thereby saving them money (currently they have to rent gear) and to enhance their business. This includes water pumps, irrigation pipes, greenhouses and equipment to cook tomato seconds for sale as chutney and tomato sauce. They have other ideas to develop as well but without access to resources they have not been able to develop them. The funds will be revolving so as they are repaid, they will be lent out again. It will be lent to groups rather than individuals. The annual interest is calculated at 10%. The amount required in US$5,500 each year for three years.